Marseilles; 12 March 1883. 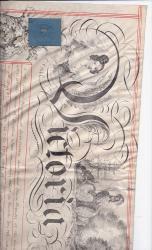 On letterhead of the Sunbeam, Royal Yacht Squadron. 1p., 12mo. In good condition, lightly aged. Illustrated letterhead, printed in gold, red, blue and purple. Writing on behalf of his wife as well as himself, he explains that 'absence from England will prevent them accepting the kind invitation of Ms. Harrison Blair for Easter Sunday'. 2pp., 4to. In good condition, on lightly-aged paper, with slight wear at head of second leaf. She begins: 'I always love to receive a letter from England, especially at this time of year when I become especially homesick, thinking of April at home with the bluebells and the primroses out! Your description of the forget-me-nots, tulips, fruit-blossm etc . . .
[Offprint leaflet.] What has been done with one deaf child in his own home. Reprinted from the Journal of Proceedings and Addresses of the National Educational Association, Asbury Park, N.J., 1905. 3pp., 8vo. Paginated -903. Bifolium. In fair condition on aged and creased paper. With shelfmark, stamp and labels of the Board of Education Reference Library, London. Autograph Signature of the English actress Anna Neagle. 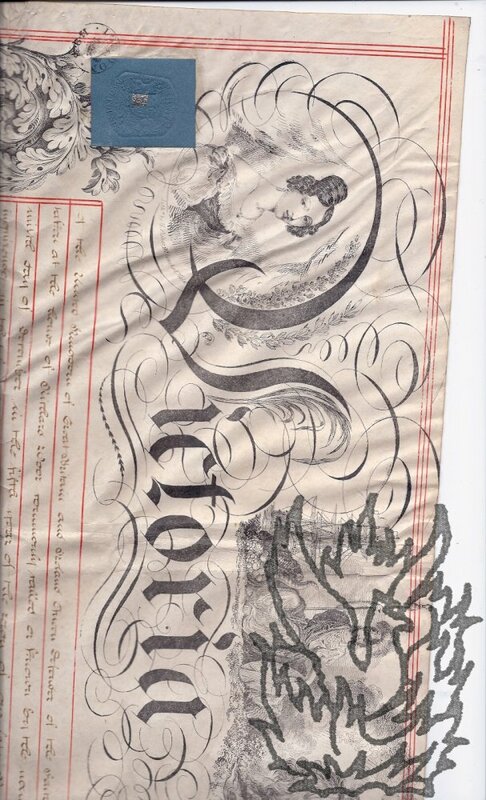 On rectangle of paper, laid down on leaf removed from autograph album. In fair condition, on lightly-aged paper. Reads 'Good wishes | Anna Neagle.' With two newspaper cuttings carrying photographic portraits, one loose and one laid down to the left of the signature. 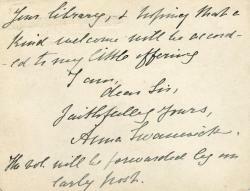 Autograph Card Signed to unnamed male correspondent [the headmaster of Harrow School?]. 20 March [no year, but after 1892]; on letterhead of 23 Cumberland Terrace, Regents Park, N.W. On both sides of the gilt-edged card, which is roughly 9 x 11.5 cm. Aged, but in fair condition. 'Mr Bosworth Smith' has informed her that her book 'Poets the Interpreters of Their Age' (1892) 'will be acceptable to the pupils of Harrow School', and she has 'great pleasure in presenting a copy to your library, & hoping that a kind welcome will be accorded to my little offering'. A postscript explains that the volume 'will be forwarded by an early post'. Autograph Signature on fragment of document. Irish-born author (1800-81; nee Fielding), wife of Samuel Carter Hall. On slip of paper roughly 14 centimeters by 2 centimeters. In good condition, although paper discoloured and with traces of glue from previous mounting on reverse. Apparently the foot of a page of printed accounts, with 'Brewster & West, Printers, Hand Court, Dowgate.' in bottom left-hand corner. 'To be returned to Mrs. S C Hall on or before the 1st. 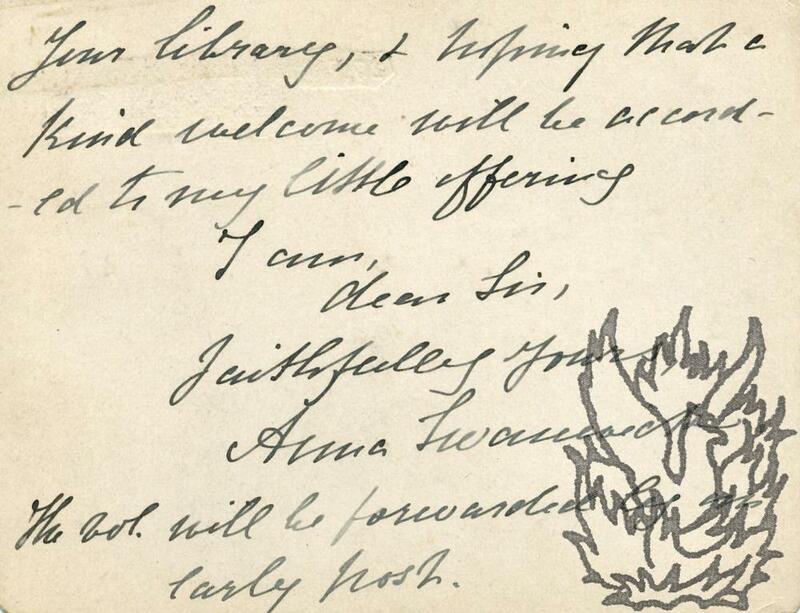 of June' written over the printed part, but the signature 'Anna Maria Hall' written across clear paper.